Like herbs & spices speak to a chef, wood speaks to Matthew Smith. 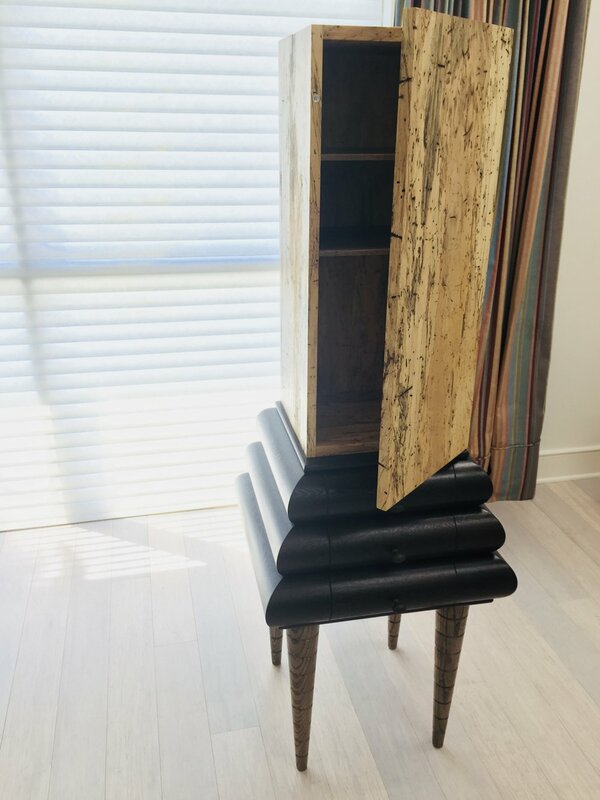 This cabinet looks as if it could walk around on it's own, so it has been named Mnyama (knee-yama) Swahili for animal. Below is Matthew's story. Here’s a small, 3-drawer, 1-door cabinet that, amongst other things, can be used for storing wine and liquor. Regardless of how it is ultimately used, you know whatever is inside is very special. A little background…While visiting my hardwood supplier I came across a thick, beautiful board of Wenge, a dark brown, chocolate colored African hardwood that is extremely dense and is sought after for its tight growth rings and naturally dark and delicious colors. This particular piece of wood was special. It was long and straight with no visible knots or defects. And just around the corner from the Wenge sat a bin full of Tamarind, a tropical fruitwood tree that quite often becomes impregnated with bugs and worms as it grows and ages. Tamarind is primarily a yellowish, blonde colored wood with occasional patches of light browns, grays and tans. The bug traffic and worm holes, along with the natural fungal activity, imparts a spalted quality with sharp lines of blacks and browns that appear like ink drawings from an artist’s pen. I immediately thought that the dark colored striations of the Tamarind would work well with the dark chocolate colors of the Wenge. So I set out to concept a few designs that would showcase the spectacular qualities of the thick slab Wenge coupled with the spalted qualities of the Tamarind. This piece playfully combines these wonderful qualities and gives life to a piece of furniture. The tapered legs with ringlet grooves elevate the piece to a comfortable height. The sock-like legs are ash with a light grayish stain topped with dark brown filler. The Wenge and Tamarind are unstained with multiple coats of Waterlox, a tung-oil based hand rubbed finish.